Of the many poll sops that Rajasthan Chief Minister Ashok Gehlot doled out in the past two years, the one scheme that seems to have struck the right chord with voters is the initiative to give free essential medicines at government healthcare facilities. The Mukhyamantri Nishulk Dava Yojna, launched in 2011, has offered some hope to the incumbent Congress government, which is projected to be voted out of power in the December 1 elections. Charan Singh, a resident of Kafanwada village in Alwar district, says his impression about the Congress government changed after he had to spend only Rs 45 for buying one medicine when his 13-year-old son was operated upon for an ear infection and was admitted for five days at a government hospital. Like Singh, many people in the state, according to government data, have benefitted from the scheme and believe it will go a long way in deciding the image of the government. The state government says the scheme has benefitted 76.3 million people—which is around twice the number of voters in the state (40.7 million). Riding on its success, the state government launched the Mukhyamantri Nishulk Janch Yojna in April this year to provide free diagnostic services to patients in government hospitals. The Congress believes the scheme will ensure a win and the Bharatiya Janata Party (BJP), while criticising the implementation of the scheme, plans to continue it if chosen to power. Mumtaz Masih, president of the Rajasthan Congress committee for the election campaign, says, “Officially, around 250,000 people are being given medicines free of cost every day. About 15 states have shown interest in the scheme.” The Congress has also included the health schemes in its manifestos for Delhi and Madhya Pradesh. BJP state spokesperson Vimal Katiyar told Down To Earth that his party “will improve the schemes and make them more effective” if they win. The scheme has directed government doctors only to prescribe generic drugs or salt names and not the names of medicines or brands. With this, it has addressed the basic problem of doctors prescribing expensive branded medicines for favours from pharmaceutical companies. As a result, if a government healthcare centre does not have a particular generic drug patients can buy it from a chemist at an affordable price. The generic drug for a 30-day course for hypertension costs Rs 29, which is substantially lower than its branded counterpart that sells for Rs 436. Similarly, the generic drug for diabetes mellitus is Rs 17 and the branded drug sells at Rs 481 (see ‘The premium we pay for branded drugs’). The scheme also directs doctors to write prescriptions on self-carbonated slips, which are audited at regular intervals. The scheme is being implemented at 15,000 hospitals across the state and the free medicines are being distributed through 16,053 drug distribution centres established at all healthcare institutions in the state. Samit Sharma, managing director of Rajasthan Medical Services Corporation (RMSC), the body responsible for the scheme, says transparency is responsible for the success of the scheme. Sharma, when he met this reporter on November 13, showed an SMS that read 240,000 patients benefitted from the scheme that day. It also had a list of the drugs that were unavailable in different distribution centres. The SMS is sent every day to 7,000 doctors and authorities engaged in the scheme by inventory management software e-Aushadhi. The software stores inventory data such as the amount of drugs issued to the distribution centres and the amount consumed. It also helps in locating drugs in warehouses and facilitates transfer of drugs between them. RMSC was set up on April 4, 2011, for centralised procurement of generic drugs in bulk to lower the cost. It has prepared an essential drug list using the World Health Organization and national list of essential medicines. The list currently has 607 medicines, 73 surgical and 77 suture items. For procurement, RMSC organises a two-bid e-tendering process that includes technical and financial evaluation for the suppliers. For storing the purchased medicine, 34 drug warehouses have been set up in each district. RMSC says all manufacturers are directed to check the quality of the ingredients used and of the finished products. It is mandatory for suppliers to send test report with each batch supplied. RMSC also tests the drug before releasing the batch in hospitals. A budget of Rs 200 crore was allocated for the scheme in 2011-12, which was increased to Rs 341 crore for 2012-13. Talking about the importance of the scheme, Sharma says World Health Organisation statistics suggest 65 per cent of Indians do not have regular access to essential medicines. Around 23 per cent people do not go for treatment because they do not have money. “All these things happen despite India being the third largest manufacturer of generic medicines, therefore, we launched the scheme,” says Sharma. The sections opposing the scheme allege poor quality medicines and lack of doctors are crippling it. Anwar Khan, a resident of Amar Sagar, which is five kilometres from Jaisalmer, says he had to take his wife to a private clinic after the free drugs failed to cure his wife’s ailment. 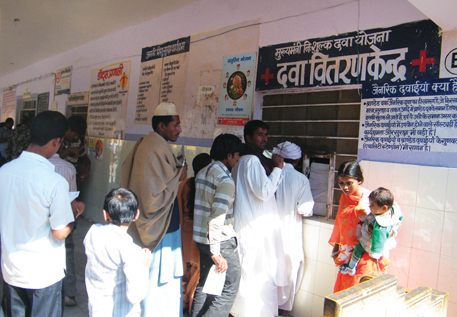 Pawan Janga, the owner of a medical shop outside Jaisalmer district hospital, says many patients throw the free medicines given at the government hospitals in the dustbin. He, however, admits that his business has gone down by 50 per cent after the launch of the schemes. Janga says the scheme has benefitted government doctors who now spend more time at their private clinics where they continue to prescribe expensive medicines. “Now many people want to get treatment from the same doctor but at his/her residence because they are unsure of the free medicine,” says Janga. Even doctors are not happy with the government directive to prescribe only generic drugs. B D Jetha, a surgeon at the Jaisalmer district hospital, says because generic tablets have a single salt in them, patients have to consume four to five medicines even for a simple disease. “In contrast, branded tablets have a combination of salts which are better,” he says. He also alleges that free medicines should only be given to the needy to avoid shortage of stocks. Sharma refutes the claim that medicines with multiple salts are better and says the World Health Organization recommends single salt medicines. “Still we have included a few combination drugs in our purchasing list on the demand of doctors,” he adds. Sanjay Parik, senior manager of drugs quality control at RMSC, says the public perception that the free medicines are inferior is based on misconception propagated by doctors and chemists who are adversely affected by the scheme. “A complete mechanism has been developed to check the quality at several levels. In contrast, the medicine available in the market is checked occasionally, but people have confidence because they are spending huge sums of money. Doctors, who are supposed to accelerate the programme, are creating confusion,” says Parik. The scheme is also facing criticism due to the shortage of doctors in government hospitals. Media reports say that more than 25 per cent posts for doctors in medical colleges and district hospitals in Rajasthan are lying vacant. The PRS Legislative Research, an organisation which does research on legislative process, says 57 per cent posts for surgeons in community health centres, 45 per cent posts for gynaecologists, 49 per cent posts for physicians and 24 per cent posts for paediatrician are vacant in Rajasthan’s state heath centres. While the Rajasthan government says it has initiated efforts to fill up the vacant posts, it maintains that shortage of staff is a problem that is seen in almost all the states in the country. 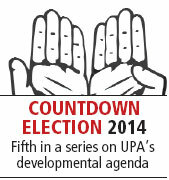 Will welfare schemes win votes for UPA?